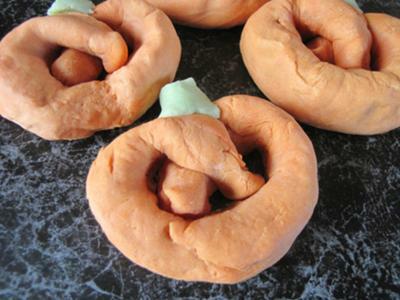 I made this recipe because I realized a pretzel shape is the same shape as a pumpkin. 1. Preheat oven to 475 F degrees (245 C). 2. In two mixing bowls, mix two tablespoons warm water with yeast. 3. Add orange food coloring to one bowl for the basic pumpkin shape. 4. Add green food coloring to the bowl that you did not add the orange coloring to (this will be the stem color). 5. Add brown sugar to bowls. 6. Add flour gradually and continue mixing to both bowls. 7. Knead dough on a clean surface (DO NOT MIX ORANGE AND GREEN DOUGH). 8. Make pretzel shape with orange dough and lay on buttered pan top with a stem from the green dough. 10. ENJOY your spooktacular treat! I love this idea, so cute! Pretzels are the best, and i love the pumpkin theme. Great idea! I love the pumpkin pretzels. They look so cute. My kids get so many sugary sweets on Halloween that it is great to have a healthy treat that will be fun to make and great to eat!